Lansing, MI is located in the Grand River watershed which flows into Lake Michigan. 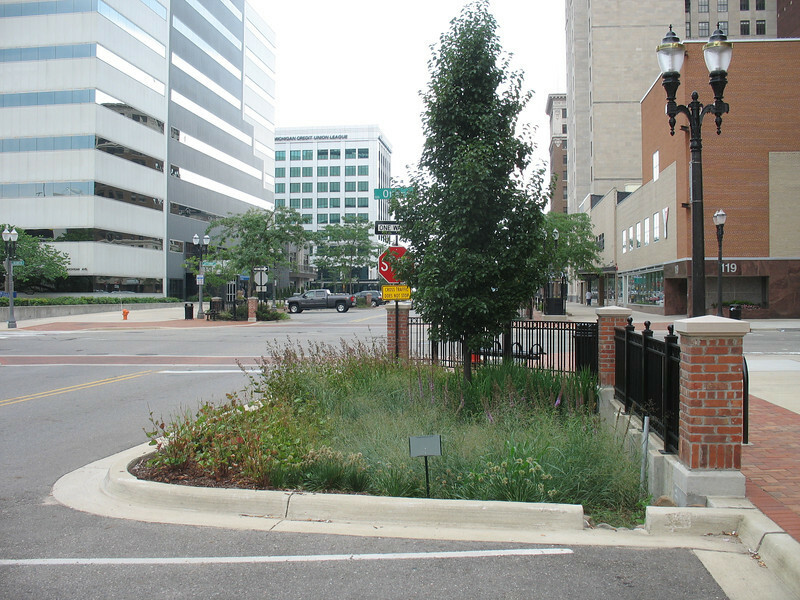 To deal with the number one source of water pollution in the United States, a category 5 Transportation Enhancement grant helped to redefine the streetscape along Michigan Avenue. 20 rain gardens or bioretention areas were installed along a four block section of the street to help reduce polluted stormwater runoff. $2 million in Federal funding was acquired in 2006 for the project. A $500,000 local match in addition to a Michigan Department of Environmental Quality Clean Michigan Initiative Grant and an Environmental Protection Agency Non-Point Source Grant also funded the project. The project included the construction of rain gardens and the addition of lighting. The rain gardens filter and keep harmful pollutants such as fertilizer, pesticides, trash, and pet waste out of storm drains. The runoff and any over flow is diverted away from storm drains and into gardens where strong and deep root systems filter out pollutants before the water enters the storm drain clean. In addition to the benefit of increased water quality, rain gardens help create a pedestrian friendly and attractive streetscapes.